What is Electrical Stimulation? Advances in Stroke Treatment. Electrical stimulation, also referred to as e-stim, NMES, or FES, can be an effective tool in reducing the symptoms of stroke, such as increasing strength and function. 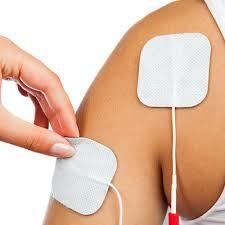 The success of one’s recovery using electrical stimulation will rely heavily on proper electrode placement. Standard electrical stimulation programs can be used to enhance upper and lower extremity muscle re-education and functional use of the arm, hand or leg. The stimulation can be delivered by either a stationary or portable FES electrode unit, or through an external neuro-prosthetic device. Another form of FES is the FES cycling program. The FES bikes are specially designed ergonomic bicycles which a person can use from their wheelchair, using electrical stimulation through electrodes to cycle with and without motor support. These bikes can be used for either arm cycling or leg cycling. The benefits of FES cycling are numerous—from aerobic conditioning to increased circulation, spasticity management and muscle flexibility. Individuals who may benefit from FES cycling include people with incomplete or complete spinal cord injury, brain injury, stroke, or multiple sclerosis. To learn more about what electrical stimulation devices are currently available on the market, click below for more information. Electrical stimulation or neuromuscular electrical stimulation (NMES) is a technique used to elicit a muscle contraction using electrical impulses. Electrical current is then sent from the unit to the electrodes and delivered into the muscle causing a contraction. 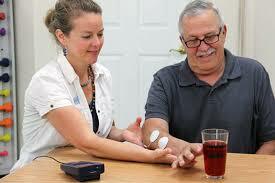 EMG-Triggered Stimulation is based on the user’s voluntary movement, or intent to move. Electrodes, controlled by a unit, are placed on the skin over a specific area. Once the user attempts to contract his or her muscles and reaches the prescribed threshold, stimulation is triggered (delivered) to the same muscles. Various visual and auditory feedback options monitor the progress.